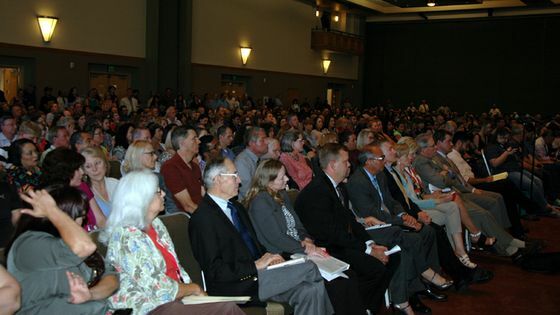 Anticipating multi-million dollar reductions in revenue as the state grapples with a massive budget shortage, The University of New Mexico held a town hall session recently to inform the campus community, and to hear concerns and suggested solutions. About 500 staff, faculty and students packed into the SUB ballroom to listen to President Robert Frank, Provost Chaouki Abdallah and Executive Vice President for Administration David Harris, outline the financial reality and initial preparations for dealing with it. Harris said current projections amount to a 7.3 percent reduction in state appropriations, meaning UNM’s share could add up to a $22.5 million cut in the current fiscal year’s budget. Although he emphasized that no one knows what the legislature will do. Frank told the audience main campus could see $14 million in reductions. In preparation, he has announced a hiring moratorium for main and branch campuses. All vacant staff positions will be frozen, with remaining budgets swept to central reserves. Abdallah added that he has instructed deans to reduce faculty hiring by 50 percent, as well. paint a bleak picture of the UNM budget. Frank also talked about long term strategies to deal with the budget process differently, even after the current issues are addressed. He said UNM is beginning a campus-wide process for strategic balancing of academic programs and administrative services. The president called for a “bottom up approach” using the expertise of faculty and staff set the framework for how to evaluate long-term fiscal concerns, and he repeatedly invited the audience to take part by joining the committee.